Thanks to the prayerful support of our donors, we are pleased to announce that the cost of an ultrasound machine has been covered for Dr. Zacharia at El Gigaiba Hospital. 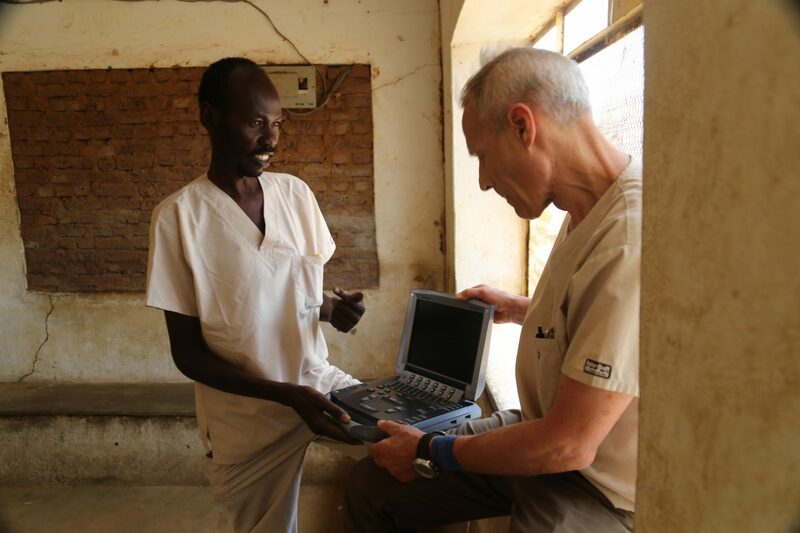 During a recent trip to the Nuba Mountains, David Dettoni, Operations Director of the SRF, alongside Dr. PJ, U.S. missionary and SRF partner, presented Dr. Zacharia with the lifesaving medical equipment. Similar to an x-ray machine, ultrasound imaging is used to see inside the patient’s body and will allow Dr. Zacharia to better diagnose medical conditions affecting the organs, vessels, and soft tissues without needing to make an incision and before risky surgery. The ultrasound machine will directly benefit critically ill patients who would not normally have access to high-tech medical care. El Gigaiba Hospital is located in a very remote area and medical supplies are extremely limited. Dr. Zacharia often has to diagnose and treat patients with little to no equipment. “It is very important for us, especially under intensive care and surgeries, to have a good diagnostic tool,” says Dr. Zacharia. The ultrasound machine will immediately help Dr. Zacharia and his staff to greatly improve the quality of healthcare offered at the hospital, which will directly impact countless lives. And it couldn’t have happened without your generosity. Thank you for helping to sustain our life-changing initiatives in the Nuba Mountains. To keep our efforts going, we ask that you please send a donation today. Without you, our work would not be possible. Thank you and God bless you for your caring heart.